Behavioural diversity is a basic component of biodiversity, with implications in ecological interactions at the intra- and interspecific levels. The reproductive behaviour of Odonata (dragonflies and damselflies) is unique among insects and conditioned by the anatomical separation between the male’s reproductive organs and the intromittent organ. Prior to mating, males must translocate sperm from the genital pore in the ninth abdominal segment to the seminal vesicle located ventrally in the second abdominal segment. This behaviour, exclusive to odonates, is known as intra-male sperm translocation (ST). Here, we review the literature on ST and use phylogenetic comparative analyses to investigate the evolution of ST within the Odonata. Information on ST was compiled for 176 species, with the commonest variant being ST once per mating, after tandem formation (66%). Other variants found were ST involving precopulatory genital touching (10%), ST by the male alone before tandem (16%) or after copulation (5%), and repetition of ST during the same copulation (3%). The precopulatory genital touching might have evolved to detect female receptivity. ST before tandem formation might be favoured when mating opportunities are scarce and copulations are brief. ST after mating might be favoured if males need to be ready to copulate fast. Finally, repeated ST could have evolved through postcopulatory sexual selection in males with limited sperm removal ability, as a means to improve their sperm competition. The most plausible scenario for the evolution of ST is that the ancestors of the Odonata produced a spermatophore and attached it to the body, leading towards the evolution of the secondary genitalia in males. Our study emphasises the role of behavioural diversity to understand behavioural evolution. Unique behaviours are exclusive of a few individuals, populations and/or species. The intra-male sperm translocation (ST) of dragonflies and damselflies is a unique behaviour in animals: before mating, males need to transfer sperm from the primary to the secondary genitalia, which are anatomically separated. Thus, the viability and quality of sperm (i.e. fertility) will depend on the timing of ST relative to copulation. Our literature review found a variety of ST variants, being ST in tandem and before copulation the ancestral strategy. We discuss putative evolutionary routes for all the variants found and emphasise the importance of retrieving detailed observations of such unique behaviours in the field, which could help to better understand behavioural evolution in this insect group. 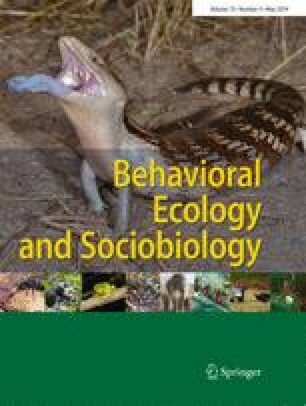 Behavioural diversity is rarely addressed by conservation strategies, despite unique behaviours being at a higher risk of extinction. The online version of this article ( https://doi.org/10.1007/s00265-019-2660-5) contains supplementary material, which is available to authorized users. We thank Reiner Ritcher for providing the picture in Fig. 1e and for sharing with us his unpublished observations, Andreas Martens for his help with German literature and Naoya Ishizawa for providing us with pdfs and translations of very relevant Japanese papers. Two anonymous reviewers provided comments that helped us improved our manuscript. ART is supported by an FPI grant of the Spanish Ministry of Economy and Competitiveness (MINECO, BES-2015-071965). Funding was provided by a grant from MINECO, including FEDER funds to ACR (CGL2014-53140-P).